In the town of Vilagarcía de Arousa on the windswept west coast of the Spanish region of Galicia, there is a company called Audiorestauración, working in digitization and restoration of sound recordings. 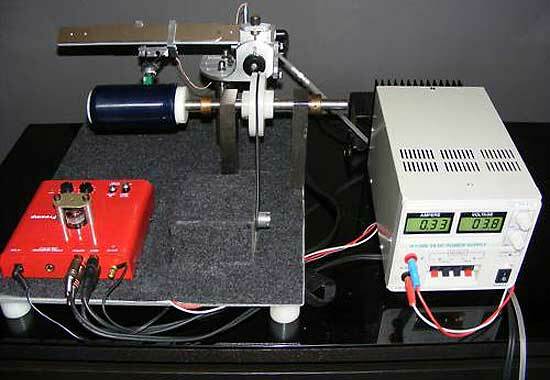 They have assembled a cylinder player which I would qualify as a classical engineer's machine: a metal baseplate, two metal columns holding a massive axle with a nylon pinion and interchangeable nylon cylinders. It is equipped with a Terminator linear tracking tone arm with air bearing. The arm can be adjusted in height and along the direction of travel, and the tone arm assembly is mounted on two metal bars that are fastened to the base plate. The signal is fed to a Tracer Technologies preamplifier equipped with one vacuum tube. The amplifier has been turned around on the baseplate to give easier access to the connectors, among them a headphone jack for direct listening. The tone arm and mandrel from above. 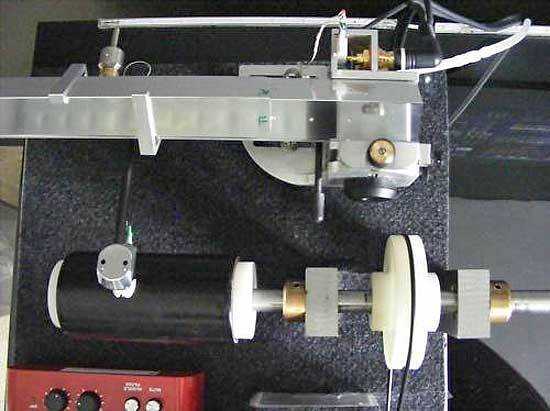 The Terminator tone arm is made of two metal profiles, one on top of the other. 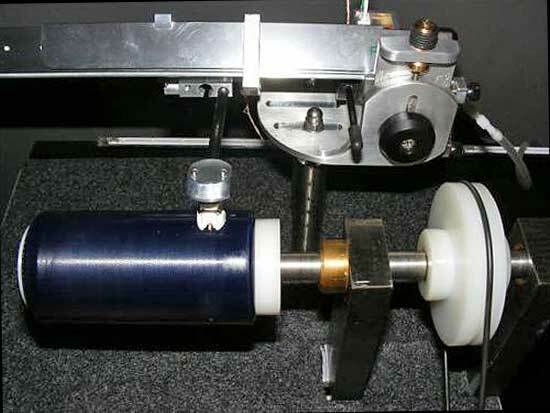 Air comes out of holes in the lower profile (seen as white dots in the photo) and floats the upper profile (here with green markings) that carries the tone arm suspended under it. The mounting of the drive motor is somewhat original, on top of the baseplate on the operator side, rather than hidden behind the mandrel axle or under the baseplate, adding tho the "engineering" feel of the player. Speed can be checked by a stroboscope, and the drive current is fed to the motor from a rather big white box with a voltage meter, seen to the right of the player itself. One thing that is not seen in these images is the air compressor for the tone arm. It seems the tone arm is sold with or without air supply, so I assume this can come in very different shapes and sizes. The tone arm and mandrel from the operator's point of view. On the tone arm assembly we can clearly see the adjustments for height and along the direction of travel. The horizontal black rod just to the right of center is the tonearm lift lever.